We describe an in vitro assay to model chorioallantoic attachment, the first step in placenta formation. The protocol demonstrates the dissection and explant culture of murine allantoides on immobilized α4β1 integrin. Allantois attachment is evaluated microscopically at pre-determined time points. Hadamek, K., Keller, A., Gohla, A. Dissection and Explant Culture of Murine Allantois for the In Vitro Analysis of Allantoic Attachment. J. Vis. Exp. (131), e56712, doi:10.3791/56712 (2018). The placenta is essential for the growth and development of mammalian embryos. For this reason, numerous genetic alterations and likely also environmental insults that disturb placenta development or function can cause early pregnancy loss in mice and humans. Nevertheless, simple in vitro assays to screen for potential effects on placenta formation are lacking. Here, we focus on modeling the first and critical step in placenta formation, which consists of the attachment of the allantois to the chorion. We describe a method to rapidly assess the attachment of allantoic explants on immobilized α4β1 integrin, which serves as a chorio-mimetic substrate.This in vitro approach enables a qualitative evaluation of the attachment and spreading behavior of multiple allantois explants at different consecutive time points. The protocol may be used to investigate the effect of targeted mouse mutations, drugs, or various environmental factors that have been linked to pregnancy complications or fetal loss on allantois attachment ex vivo. The placenta is indispensable for embryonic growth and development in the uterine environment. It constitutes the interface for oxygen, metabolite, and nutrient exchange between the fetal and maternal circulation, and also functions as an endocrine and immunological organ. Any endogenous or exogenous insult that impairs placental development can lead to intrauterine growth retardation, fetal loss, or pregnancy complications, both in mice and in humans1.While the number of targeted mouse mutations that cause abnormal placental physiology continues to increase2, with 219 genotypes currently listed on the Mouse Genome Informatics (MGI) website (http://www.informatics.jax.org/vocab/ mp_ontology/MP:0010038), many of these phenotypes are not well understood from a mechanistic point of view. In addition to genetic alterations, small molecule drugs, monoclonal antibodies, toxins, pathogens, excess metabolites, or various environmental agents may affect placenta development and function3,4,5,6,7. Yet, simple in vitro assays that model critical steps in placenta development are scarce. Murine placental development is initiated in early midgestation, when the allantois (the developmental precursor of the umbilical cord) emerges from the posterior end of the embryo as a bud that grows toward the chorion8. Chorioadhesive cells in the outer layer of the allantoic bud mediate the attachment and spreading of the allantois on the surface of the chorion (chorioallantoic "fusion"). The chorion subsequently folds into villi into which the vasculature of the allantois grows to form the labyrinth, the inner placental layer where nutrients and oxygen are exchanged between closely juxtaposed maternal blood sinusoids and embryonic vessels9,10. The attachment of the allantois to the chorion is the initial and critical step in labyrinth formation, and defects in this process are among the most common causes of embryonic lethality in midgestation1. Although a number of mouse mutants have been described where chorioallantoic attachment fails to occur10, and the MGI database currently lists 108 mouse mutants that are characterized by abnormal chorioallantoic fusion (http://www.informatics.jax.org/vocab/mp_ontology/MP:0002824), the intercellular interaction between the vascular cell adhesion molecule-1 (VCAM-1, expressed on the allantoic mesoderm) and α4β1 integrin (expressed on the chorionic mesothelium, which is derived from extraembryonic mesoderm) appears to be indispensable for chorioallantoic attachment and fusion11,12,13. Immunohistochemical staining of whole-mount wild-type embryos has shown that VCAM-1 is expressed within the distal two-thirds of the allantoic stalk at approximately embryonic day (E) 7.513 (1-4 somite stage), and that its expression remains high during chorioallantoic attachment and -fusion11,12. Failure of allantoic attachment to the chorion is typically detected by histological analyses of uterus buds. However, allantois sizes are physiologically highly variable in between and even within litters of the same developmental stage14, and the allantois can only attach to the chorion when it has reached a sufficient size to make physical contact. Reflecting this natural variability, chorioallantoic attachment takes place sometime between ~ E 8.0 and E 9.0 in utero, and a statistically reliable evaluation of this process by histology is therefore dependent on the analysis of a large number of conceptuses to obtain enough specimens at the appropriate developmental stage. Here, we describe a method to assess allantoic attachment ex utero that is less dependent on allantois size. We demonstrate the dissection of mouse embryos and their allantoides from the uteri of pregnant mice ~ 8 days post coitum (dpc; dpc 0.5 designates the detection of a vaginal plug), and the subsequent culture of allantois explants on immobilized α4β1 integrins. This method enables a rapid, functional evaluation of the attachment and spreading behavior of multiple allantois explants in parallel and at different successive time points. The protocol may be used to screen for the effects of targeted mutations, drugs, or various environmental factors on allantois attachment ex vivo. Mouse breeding was approved by the Regierung Unterfranken, and all analyses were carried out in strict accordance with all German and European Union applicable laws and regulations concerning care and use of laboratory animals. Reconstitute the lyophilized murine α4β1 integrin at 200 µg/mL in sterile phosphate-buffered saline (PBS). Dilute to a final concentration of 10 µg/mL in pre-warmed (37 °C) PBS. Pipette 20 µL/well of the diluted α4β1 integrin solution into the required number of wells of a microtiter plate (1 allantois/well). NOTE: Avoid the formation of air bubbles when coating the wells of the microtiter plate. Incubate the microtiter plates for 60 min at 37 °C by placing them in a humidified tissue culture incubator. Carefully aspirate the supernatant with a pipette. Use gentle suction and incline the plate to avoid touching the well bottom with the pipette tip. Wash wells twice by adding 50 µL of pre-warmed (37 °C) culture medium such as Dulbecco's Modified Eagle Medium (DMEM), and remove the washing medium by gentle suction. Critical step: Block free binding sites by adding 50 µL/well of 0.1% (w/v) bovine serum albumin (BSA)/DMEM and incubate for ≥ 30 min at 37 °C by placing the microtiter plates in a humidified tissue culture incubator. NOTE: Allantois explants can attach to various surfaces in the presence of serum. It is therefore imperative to block non-specific binding sites, after coating the wells with integrin, and before adding the dissected allantois for explant culture in serum-containing medium (see step 4.4). Keep the coated wells in the blocking solution at 37 °C until needed in step 4.4. NOTE: Reduce false-positive pregnancy rates by weight gain discrimination15. Sacrifice the mouse by cervical dislocation. Disinfect the coat in the abdominal area by spraying it with 70% (v/v) ethanol. NOTE: Wear gloves when handling mice. Euthanasia by cervical dislocation without anesthetics prevents chemical contamination of the allantois, which may interfere with allantois attachment. Open the abdominal skin by making a small incision at the midline with scissors. Use gloved fingers to hold the skin above and below the incision, and pull the skin apart towards the chest and tail of the mouse. Grasp the peritoneum with forceps. With the other hand, make a V-shaped incision from anterior towards posterior using scissors, and move the tissue away to expose the abdominal cavity. Use the forceps to push the intestines to one side in order to gain access to the uterus. Locate the two uterine horns. Hold the cervix (the caudal segment) with forceps and cut the ligaments with fine scissors. Then detach both uterine horns by severing the oviducts with scissors. Use forceps to transfer the uterus into a sterile 10 cm dish containing sterile, room temperature (RT) PBS. Remove the adipose tissue, vessels, and nerves surrounding the uterine horns with fine forceps and/or scissors (Figure 1A). NOTE: Perform the following steps under a stereomicroscope equipped with an 8:1 zoom range. Separate the embryos by cutting in between the implantation sites with scissors. Grasp the muscular uterine lining of the uterus buds with forceps and pull it apart to expose the decidua (Figure 1B). Using forceps, transfer the uterus buds into a new 10 cm dish containing sterile, RT PBS. Fix the decidua around the embryo with the tips of forceps. Make an incision on the anti-mesometrial side of the decidua with fine forceps (Figure 1C), and peel the decidua away with forceps to expose the embryo (Figure 1D). NOTE: The mesometrial pole of the decidua is highly vascularized and can be wider at its base than the anti-mesometrial part, which contains the embryo and appears paler. Dissect the embryo with forceps (Figure 1E, F). Using a micro-spoon, transfer the embryo into a drop of sterile PBS contained in a sterile 3.5 cm dish. Transfer the embryo into a fresh drop of PBS in the same 3.5 cm dish using a micro-spoon, and dissect the embryo from the yolk sac using forceps (Figure 1G, H). Optionally, if needed (e.g., for genotyping by polymerase chain reaction), transfer the yolk sac into a sterile tube by aspirating it with ~ 5 µL PBS into a large orifice 200 µL pipette tip. Store at -20 °C. NOTE: Maternal tissue (i.e., the parietal yolk sac including Reichert's membrane and the ectoplacental cone) that may contaminate the yolk sac preparation can lead to erroneous genotyping results. Removal of these tissues is easiest prior to the embryo dissection from the yolk sac. Cut the allantois from its basal insertion site at the posterior end of the embryo using fine forceps (Figure 1H). Optionally, if developmental staging is required, count the somite pairs of the embryo by visual inspection using a microscope equipped with phase contrast optics and a 5× and 10× objective. NOTE: The embryo can be extended with forceps to facilitate somite counting. Chorioallantoic attachment and fusion occur between E 8.0 and E 9.0 in embryos with ≥ 6 somite pairs. Turning begins in embryos with 6-8 somite pairs. Pipette 40 µL/well of DMEM supplemented with 10% (v/v) fetal bovine serum, L-glutamine, and antibiotics in the required number of pre-coated microtiter plate wells (see Section 1). Collect the floating allantois by aspirating it with ~ 5 µL PBS into a large orifice of a 200 µL pipette tip. Transfer 1 allantois/well. Incubate the allantoides by placing the microtiter plates in a humidified tissue culture incubator (37 °C, 5% CO2) for e.g., 6, 12, and 24 h. In order to prevent interference with allantois attachment, do not move the microtiter plates in between these time points. At each time point, score allantois attachment (e.g., no attachment/floating allantois; partially or fully attached allantois; fully spread allantois) using a microscope equipped with phase contrast or differential interference contrast optics and a 5× or 10× objective (Figure 2). NOTE: Representative examples of freshly isolated and fully attached allantoides are shown in Figure 2. Ex utero, the distal tip of allantoides isolated from wildtype C57BL/6J mice attaches within 4-6 h (this is referred to as partial attachment of the allantois), and full attachment of the entire allantois is achieved within ~ 12 h of culture. By 18-24 h, the explant has flattened and assumed a circular shape (referred to as fully spread allantois) with a CD31-positive vascular plexus9,16. Aspirate the culture medium of fully spread explants and fix the cells by adding 40 µL/well of 4% (w/v) paraformaldehyde/PBS. NOTE: Paraformaldehyde is toxic. Wear gloves and safety goggles to avoid skin and eye contact. Incubate for 10 min at RT, then aspirate the supernatant. Wash three times by adding 40 µL/well of PBS, and remove the washing medium by gentle suction. Permeabilize the cells and block non-specific binding sites by adding 40 µL/well of 0.1% (v/v) Triton X-100/0.1% (w/v) BSA/10% (v/v) normal goat serum in PBS for 30 min at RT. Wash twice by adding 40 µL/well of PBS, and remove the washing medium by gentle suction. NOTE: The protocol can be paused overnight at this point. Stain cells by adding 20 µL/well of primary anti-CD31 antibodies diluted 1:50 in 0.1% (w/v) BSA/PBS overnight at 4 °C. Wash three times by adding 40 µL/well of PBS, and remove the washing medium by gentle suction. Detect bound primary antibodies by adding 20 µL/well of fluorescently-labeled secondary goat anti-rat antibodies diluted 1:200 in 0.1% (w/v) BSA/PBS for 1 h at RT. Protect microtiter plates from light by wrapping in aluminum foil or by placing in a dark chamber. Wash three times by adding 40 µL/well of PBS, and remove the washing medium by gentle suction. Embed cells by adding 20 µL/well of mounting medium. Incubate for ~ 1 h at RT until the mounting medium has solidified. Store microtiter plates at RT or at 4 °C, protected from light. Image the vascular plexus of the allantois explants under a fluorescence microscope equipped with a 5× or 10× objective and suitable fluorescence filters. NOTE: Representative images of the CD31-positive vascular plexus of a fully spread allantois are shown in Figure 3. Other markers for the vascular plexus, such as antibodies directed against Flk-1, Flt, Tie-1 or Tie-2 can be used as well16. This protocol describes a method to isolate and explant murine allantoides ex vivo, and details the qualitative assessment of allantois attachment to α4β1 integrin, a critical process during in vivo chorioallantoic fusion. The representative results shown in Figure 1A-H demonstrate the successive steps of allantois isolation starting from the pregnant uterus. Maternal tissues that surround the uterine horns, such as adipose tissue and vessels (Figure 1A) are removed, and embryos are dissected from the endometrium in a step-wise fashion after opening up the muscular uterine layer (Figure 1B-E). 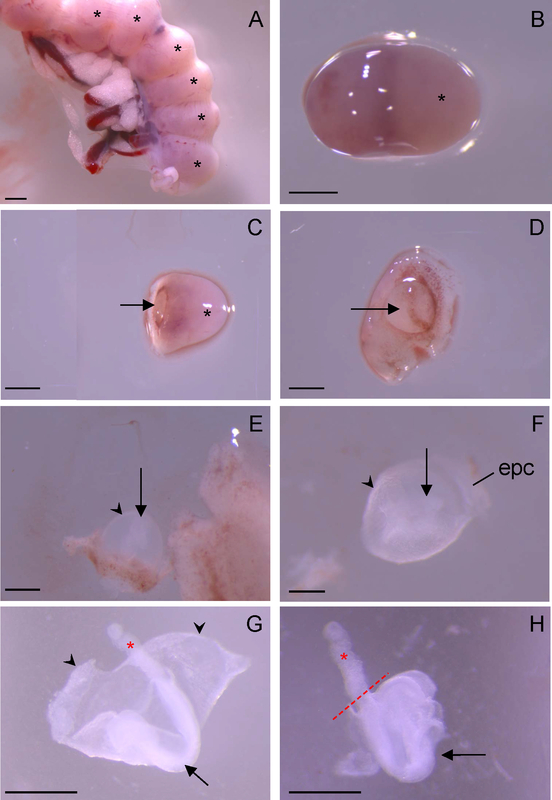 Subsequently, other maternal tissues such as the parietal yolk sac and the ectoplacental cone are removed (Figure 1E, F). Figure 1G-H shows that the technique comprises the dissection of the extraembryonic allantois away from the yolk sac, another extraembryonic and highly vascularized tissue. Thus, allantoides isolated according to this protocol are largely free of contaminating maternal or (extra)embryonic tissues other than the allantois. Figure 2 demonstrates that the size and shape of allantoides from freshly dissected embryos in one single litter can vary considerably14. Allantoides of C57BL/6J wildtype embryos dissected at E 8.5 had an elongated morphology in 74% of the cases (45 of 61 analyzed embryos), as shown in Figure 2 and Figure 1H. However, in 15% (9/61) of the embryos, the allantoides were markedly smaller and more rounded (see reference14) and 11% (7/61) of the embryos had not yet formed a visible allantois at the time of dissection. Despite the heterogeneous shapes and sizes at the starting time point of allantois explant culture (Figure 2, panels a-h), allantois attachment and full spreading on immobilized α4β1 integrin was observed within 12 h in all of the 54 freshly isolated allantoides dissected from embryos of seven litters. Nevertheless, the shapes and sizes of the explants after 12 h of culture were somewhat heterogeneous (Figure 2), reflecting the different allantoic morphologies at the starting point of the assay. Figure 3 shows an immunocytochemical staining for CD31-positive endothelial cells in fully attached allantoides after 24 h of explant culture, which confirms that the explants had elaborated a vascular plexus by this time point, as expected9,16. Such adherent allantois cultures can be used to study blood vessel formation in vitro9. Hence, the presented methodology yields allantois explants that can be easily cultured ex vivo, in agreement with previously published experimental studies9,16. The protocol sets the framework for the microscopy-based assessment of allantois attachment at predetermined time points, such as after 12 h or 24 h of explant culture. The outcomes can be evaluated in a qualitative manner (partial/full attachment or full spreading at a given time point – yes/no). Since the same explant can be repeatedly visualized and scored, this analysis reflects the characteristics of individual allantois explant cultures over time. In addition, the formation of a vascular plexus in fixed and stained explants can be assessed (Figure 3). Figure 1: Representative steps in allantois dissection. (A) Detail view of an isolated uterine horn. Uterus buds containing the embryos are marked by stars; adipose tissue and vessels surrounding the uterine horn are seen on the left side. (B) View of the decidua (the endometrium) after removal of the muscular layer of the uterus. The highly vascularized, mesometrial pole of the decidua is oriented to the left, the anti-mesometrial part (marked with a star) that contains the embryo is oriented to the right. (C) Side view of the dissected anti-mesometrial pole of the decidua (marked with a star). The arrow indicates the location of the embryo. (D) Top view of the conceptus (arrow) surrounded by the parietal yolk sac after partial removal of the surrounding decidua. (E, F) Representative views of subsequent steps in the dissection of the embryo (arrow). The arrowhead indicates the yolk sac. In (E), the ectoplacental cone (epc) is visible on the right. (G) Partial dissection of the embryo (arrow) from the yolk sac (arrowheads). The allantois is marked with a red star. (H) Isolated embryo (arrow) with allantois (red star). The position where the allantois will be cut from its basal insertion site at the posterior end of the embryo is indicated with a red broken line. Images were taken on a stereomicroscope with an 8:1 zoom range. All scale bars are 1 mm. Please click here to view a larger version of this figure. Figure 2: Heterogeneous shapes and sizes of allantoides. Eight allantoides (a-h) were isolated from embryos of one single litter. Left panel, allantoides immediately after dissection (0 h). Right panel, the same allantoides after 12 h of explant culture. The explants are firmly attached, and mesenchymal cells have spread. The explants are circled to visualize explant sizes. Images were taken on a microscope equipped with phase contrast optics and a 5× (left panel) or a 10× objective (right panel). 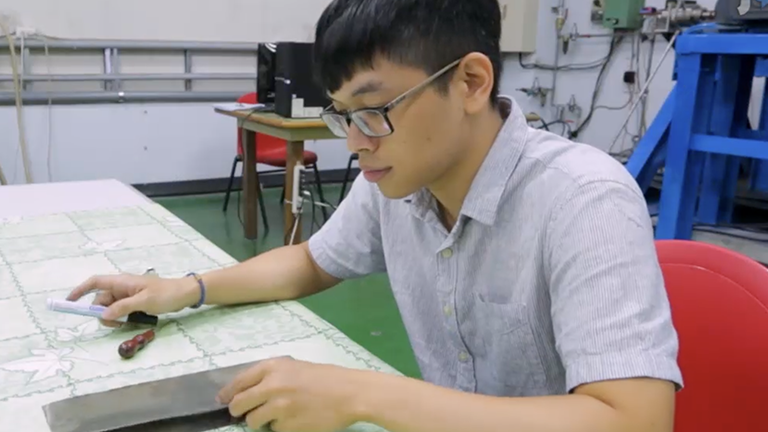 All scale bars are 500 µm. Please click here to view a larger version of this figure. Figure 3: Vascular plexus formation in allantois explant cultures. Allantoides were dissected and explanted on immobilized α4β1 integrin as described in the present protocol. 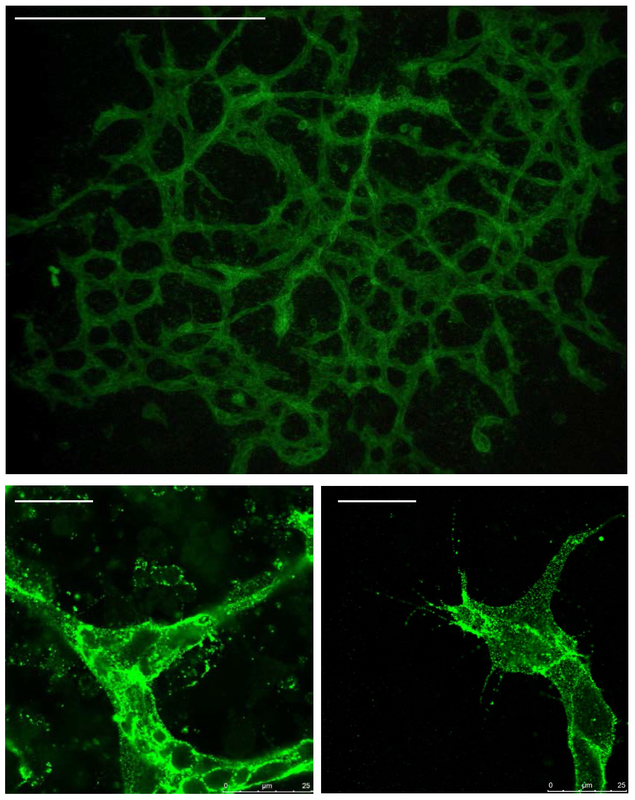 Explants were cultured for 24 h, and endothelial cells in the vascular plexus were stained using anti-CD31 primary antibodies and fluorescently labeled secondary antibodies. Endothelial cells appear in green. The upper image shows the entire vascular plexus in the central area of a representative allantois explant. The image was taken on a microscope equipped with fluorescence optics and a 5× objective. Scale bar, 500 µm. The two lower panels are higher magnification images of another allantois explant dissected and cultured under the same conditions. Vessel-like structures and individual endothelial cells can be seen. Images were taken on a confocal microscope; scale bars, 25 µm. Please click here to view a larger version of this figure. In the presence of serum, which is a rich source of pro-adhesive extracellular matrix molecules such as fibronectin, allantois explants will readily attach to various plastic, glass, or filter surfaces9,16. Thus, if the aim of the performed assay is to specifically investigate the effect of a genetic modification or any other treatment on allantois attachment to immobilized α4β1, it is critical to block non-specific binding sites (e.g., with bovine serum albumin) after coating the surfaces with integrin and before incubating with serum-containing media. The initial attachment of allantois explants to immobilized α4β1 integrin is very sensitive to movement, and the tissue culture plates should therefore be left undisturbed for a pre-determined time period (e.g., for 12 h) prior to scoring allantois attachment. Note that the time required for stable contact formation with the substrate may vary depending on the analyzed mouse strain or the concentration of immobilized α4β1 integrin. The requirement of the intercellular VCAM-1/α4β1-interaction for successful chorioallantoic fusion is firmly established11,12,13. In addition, extracellular matrix molecules such as fibronectin, collagens and other molecules of interest can be also immobilized and used as "chorio-mimetic" substrates. Chorioallantoic attachment is dependent on the intercellular interaction between VCAM-1 and its binding partner integrin α4β1. In utero, chorioallantoic attachment and subsequent fusion can only occur when the allantois has sufficiently extended to make contact with the chorion. Given the physiological variability in allantois sizes at a particular developmental stage, chorioallantoic attachment and fusion take place sometime between E 8.0 and E 9.0 (range, E 7.5-E 9.25)14,16. Methods to specifically study the transient process of allantois attachment to the chorionic plate in utero in the living mouse are not readily available at present. Rather, analyses are mostly focused on the laborious determination of chorioallantoic fusion by histological assessment of e.g., allantoic spreading on the surface of the chorion and the development of the labyrinth layer at a single, pre-determined time point11,12,13,16. This endpoint analysis cannot discriminate between defects that are specifically due to impaired attachment of the allantois to the chorion and chorion-dependent effects, and is limited by the inherent variability in embryo developmental stages and allantoic sizes. As discussed under Representative Results, the physiological variability in allantois sizes may result in a relative delay in chorioallantoic fusion in ~ 26% of C57BL/6J wildtype embryos. Statistically speaking, almost two in seven pregnant mice would have therefore been sacrificed too early (61 embryos from seven litters, average litter size 8.7), which translates into the necessity of a substantial breeding excess for larger-scale studies. Interestingly, microsurgical experiments have revealed that the chorion is already competent to fuse with the allantois at the 1 somite pair stage, and that the allantois exhibits maximal fusion capacity in embryos with 3-5 somite pairs14. Hence, chorioadhesive cells of the allantois are formed and functionally competent prior to the actual chorioallantoic attachment in vivo. The ex utero analysis of allantois attachment to immobilized ligands, as presented here, is therefore relatively independent of a given allantois size. Hence, one advantage of this method is that it bypasses defects in allantois elongation, and focuses on the next step in placenta formation, i.e., chorioallantois attachment. This approach may thus be used to distinguish between defects in allantois elongation and chorioallantois attachment in genetic mouse mutants. In contrast to the traditional method of allantois aspiration from its attachment point to the embryo using a mouth pipette16, the current protocol uses a manual cutting approach, and the allantois is subsequently handled using large orifice pipette tips. An important advantage of allantois aspiration is that this method avoids direct tissue handling. Cutting and manipulating the allantois may damage the chorioadhesive cells in the outer sheath of the allantoic mesothelium. Nevertheless, cutting the allantois with forceps has been successfully used before in ex vivo cultures of pre-placental tissues17, and the kinetics of allantoic explant attachment and the morphology of the explant cultures described in the present study are similar to published data based on allantois isolation by aspiration16. These findings suggest that chorioadhesive cells are sufficiently well preserved upon manual cutting of the allantois, and that explant differentiation is not grossly perturbed, as indicated by the formation of CD31-positive endothelia. Direct cutting of the allantois also offers the possibility to dissect only the upper two thirds of the allantois that express VCAM-113, and it ensures less contamination with yolk sac-derived cells, which may have to be trimmed away from the base of the allantois after allantois aspiration18. The ex utero analysis of allantoic explant adhesion to immobilized, recombinant α4β1 integrin provides a qualitative readout of one important, initial step that is required for chorioallantoic fusion, i.e., the intercellular interaction between VCAM-1 expressed on the allantois, and α4β1 integrin localized the chorionic mesothelium, which is derived from extraembryonic mesoderm. Nevertheless, although these two adhesion molecules are recognized as principle players in chorioallantoic fusion, ~ 50% of embryos with homozygous knockout mutations in VCAM-1 or α4 integrin do undergo chorioallantoic fusion in vivo11,12,13. Because of this incomplete penetrance, the ex vivo method described in the present protocol may not be sufficient to rule out a requirement for these two adhesion molecules in genetic models with a failure of chorioallantoic fusion. Under physiological conditions, α4β1 integrins are embedded in the plasma membrane of chorionic trophoblasts, and are incorporated in an intricate network of structural and signaling proteins that cooperate to regulate cell-cell (and cell-matrix) adhesion19. As with most reductionist in vitro approaches, the complexity of the chorionic VCAM-1 binding interface is only modeled to a very limited extent by immobilized α4β1 integrin. Besides the potential lack of other important structural or signaling inputs derived from the intact chorion in this system, it is likely that only a fraction of the integrins that are immobilized on a rigid, two-dimensional surface are present in the active, binding-competent, "open" conformation. The presented method approximates the early attachment and spreading step of the allantois to the chorion, and can also report on the development of the allantoic vascular plexus when combined with the analysis of vessel formation9. However, the current approach does not model the invasion of the chorion by sprouting angiogenesis mediated by allantoic endothelial cells, nor does it reflect branching morphogenesis by the chorion, which is an essential process for chorioallantoic fusion and the subsequent development of the placental labyrinth10. Using phase contrast or differential interference microscopy combined with (semi-)automated image analysis, the presented method could be applied in larger-scale screens for the initial analysis of delayed or failed allantoic attachment in vitro. In addition to the analysis of mouse mutants, the method may be of interest to screen the effects of drugs, pathogens, metabolites, or environmental agents on allantoic attachment. In numerous mouse mutants, chorioallantoic attachment fails to occur, although the allantois and the chorion appear to have developed normally. Furthermore, mutants that show chorioallantoic attachment defects typically display incomplete penetrance1,2,10. It will be important to investigate whether these functionally apparently very different genes impact common molecular pathways and/or cellular processes. Live imaging of allantois explants derived from mouse mutants has the potential to elucidate such mechanisms. For example, cells in the outer sheath of the dissected allantois could be labeled with vital fluorescent dyes (such as DiI or DiO lipophilic carbocyanine tracers16,18) to image adhesion and spreading events, or to track cell migration in real time. In addition, fluorescent reporters that visualize the cytoskeleton or adhesion proteins may prove to be informative. 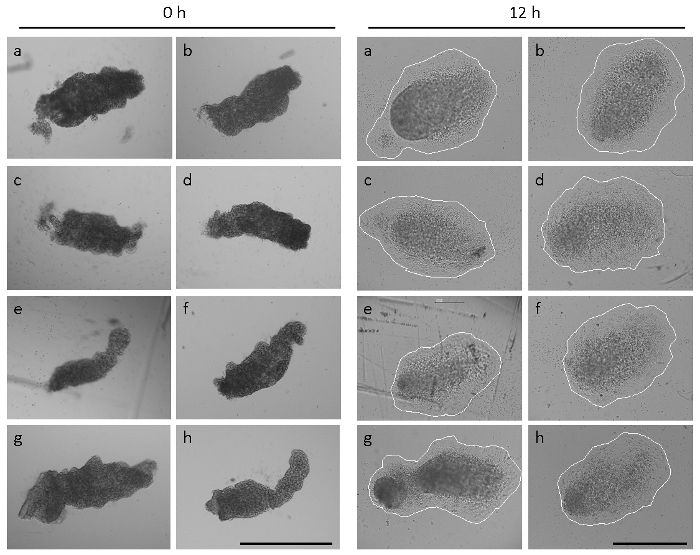 Recently, an ex vivo co-culture system for pre-attachment murine allantoides and chorions has been described, and this approach was successfully used to investigate events that occur after chorioallantoic attachment, such as labyrinth layer formation17. The analysis of allantois attachment efficiency on immobilized chorions isolated from various (e.g., genetically modified) mouse models may yield new insights into the molecular players and pathways that govern early steps in the development of the murine placenta. This work was supported by the Deutsche Forschungsgemeinschaft SFB688 (to A.G.). Standard pattern forceps Fine Science Tools 11000-12 Forceps used to open the abdominal cavity. Micro dissecting forceps Fine Science Tools 11254-20 Dumont # 5 medical biology forcepts with fine, sharp tip. Fine scissors Fine Science Tools 14094-11 Straight blades. Spring scissors Fine Science Tools 15012-12 Noyes spring scissors with 14 mm blades for the dissection of uterus buds. Microspoon Carl Roth AT18.1 5 mm Spoon diameter. Microtiter plates ibidi 81501 We use uncoated, sterile angiogenesis slides (internal volume 50 µL) with a hydrophobic surface that is not tissue-culture treated to reduce non-α4β1-mediated binding to plastic. 10 cm dish Nunc 150350 Sterile tissue culture dishes. 3.5 cm dish Nunc 150288 Sterile tissue culture dishes. Large orifice pipette tips Biozym VT0140X Low binding pipette tips, 200 µL. α4β1 integrin R&D Systems 6054-A4 Murine α4β1 integrin recombinantly expressed and purified from a Chinese hamster ovary cell line. Dulbecco's Phosphate Buffered Saline (PBS) Sigma Aldrich D8537 Without Ca2+ and Mg2+. Dulbecco’s Modified Eagle Medium (DMEM) PAN Biotech P04-03600 The formulation contains 4.5 g/L glucose, 110 mg/L sodium pyruvate and 3.7 g/L NaHCO3 but no L-glutamine, which is added separately. Penicillin/Streptomycin Gibco (ThermoFisher Scientific) 15140-122 100 x (10,000 U/mL Penicillin and 10,000 µg/mL streptomycin) stock solution. Prepare and store aliquots at -20 °C to avoid freeze/thaw. L-Glutamine PAN Biotech P04-80100 100 x (200 mM) Stock solution. Prepare and store aliquots at -20 °C to avoid freeze/thaw. Fetal bovine serum Biochrom S 0115 We use heat-inactivated FBS (heated to 56 °C for 30 min with mixing to inactivate complement). Bovine serum albumin (BSA) Sigma Aldrich A7030 We use protease- and fatty acid-free albumin. Prepare a 0.1 % (w/v) solution in DMEM. Sterile filter the solution through a disposable cell culture filter with a 0.22 µm pore size and low protein-binding membrane, and store aliquots at -20 °C. para-Formaldehyde Carl Roth 0335.2 To make a formaldehyde solution in PBS, weigh para-formaldehyde powder in a ventilated hood, and add it to PBS preheated to ca. 60 °C in a beaker on a stir plate. Add 1 N NaOH dropwise until solution clears. Let solution cool to room temperature, and filter through 0.22 mm filter syringe. Adjust pH with diluted HCl to ca. 6.9, and adjust to final volume with PBS. We aliquot and freeze the solution, but it can also be stored at 4 °C for approximately four weeks. Triton X-100 Sigma Aldrich X100 Use wide-orifice pipette tips to handle undiluted Triton X-100. Normal goat serum Sigma Aldrich G9023 To block non-specific binding of antibodies in immunofluorescence analyses. α-CD31 Antibodies BD Biosciences 550274 Purified rat anti-mouse monoclonal antibodies, clone MEC 13.3. Secondary goat anti-rat antibodies Thermo Fisher A-11006 Goat anti-rat IgG (heavy and light chains), cross-adsorbed, fluorescently labeled with Alexa Fluor 488. Other fluorescent labels are also possible. Labovert Leitz Labovert Inverted phase contrast microscope equipped with a 4 x and 10 x objective for somite pair counting. Other phase contrast microscopes (such as those that are routinely used in tissue culture) are also suitable. M80 Leica Microsystems M80 Stereomicroscope with 8 : 1 zoom range (yielding a magnification between 7.5 x and 60 x) for embryo and allantois dissection. DM4000B Leica Microsystems DM4000B Microscope system for histology with LED illumination. We use HCX PL FLUOTAR 5 x/0.15 and HC PL FLUOTAR 10 x/0.30 objectives. Other microscopes equipped phase contrast and fluorescence optics can be used to score allantois attachment. Digital camera JVC KY-F75U 3-CCD digital capture camera attached to the DM4000B LED microscope. We use Diskus software (Hilgers) to operate both the microscope and the camera. Confocal microscope Leica Microsystems SP5 Confocal microscope for higher-resolution imaging of endothelia in the vascular plexus of allantois explants. Immunofluorescence images were taken with a 40 x objective. Rossant, J., Cross, J. C. Placental development: lessons from mouse mutants. Nat Rev Genet. 2, (7), 538-548 (2001). Segerer, G., et al. An essential developmental function for murine phosphoglycolate phosphatase in safeguarding cell proliferation. Sci Rep. 6, 35160 (2016). Kane, S. V., Acquah, L. A. Placental transport of immunoglobulins: a clinical review for gastroenterologists who prescribe therapeutic monoclonal antibodies to women during conception and pregnancy. Am J Gastroenterol. 104, (1), 228-233 (2009). Xu, X., Vugmeyster, Y. Challenges and opportunities in absorption, distribution, metabolism, and excretion studies of therapeutic biologics. AAPS J. 14, (4), 781-791 (2012). Wesolowski, S. R., Kasmi, K. C., Jonscher, K. R., Friedman, J. E. Developmental origins of NAFLD: a womb with a clue. Nat Rev Gastroenterol Hepatol. 14, (2), 81-96 (2017). Racicot, K., Mor, G. Risks associated with viral infections during pregnancy. J Clin Invest. 127, (5), 1591-1599 (2017). Grandjean, P., et al. Life-Long Implications of Developmental Exposure to Environmental Stressors: New Perspectives. Endocrinology. 156, (10), 3408-3415 (2015). Inman, K. E., Downs, K. M. The murine allantois: emerging paradigms in development of the mammalian umbilical cord and its relation to the fetus. Genesis. 45, (5), 237-258 (2007). Arora, R., Papaioannou, V. E. The murine allantois: a model system for the study of blood vessel formation. Blood. 120, (13), 2562-2572 (2012). Watson, E. D., Cross, J. C. Development of structures and transport functions in the mouse placenta. Physiology (Bethesda). 20, 180-193 (2005). Yang, J. T., Rayburn, H., Hynes, R. O. Cell adhesion events mediated by alpha 4 integrins are essential in placental and cardiac development. Development. 121, (2), 549-560 (1995). Gurtner, G. C., et al. Targeted disruption of the murine VCAM1 gene: essential role of VCAM-1 in chorioallantoic fusion and placentation. Genes & development. 9, (1), 1-14 (1995). Kwee, L., et al. Defective development of the embryonic and extraembryonic circulatory systems in vascular cell adhesion molecule (VCAM-1) deficient mice. Development. 121, (2), 489-503 (1995). Downs, K. M., Gardner, R. L. An investigation into early placental ontogeny: allantoic attachment to the chorion is selective and developmentally regulated. Development. 121, (2), 407-416 (1995). Heyne, G. W., et al. A simple and reliable method for early pregnancy detection in inbred mice. J Am Assoc Lab Anim Sci. 54, (4), 368-371 (2015). Downs, K. M., Temkin, R., Gifford, S., McHugh, J. Study of the murine allantois by allantoic explants. Dev Biol. 233, (2), 347-364 (2001). Hou, W., Sarikaya, D. P., Jerome-Majewska, L. A. Ex vivo culture of pre-placental tissues reveals that the allantois is required for maintained expression of Gcm1 and Tpbpalpha. Placenta. 47, 12-23 (2016). Zeigler, B. M., et al. The allantois and chorion, when isolated before circulation or chorio-allantoic fusion, have hematopoietic potential. Development. 133, (21), 4183-4192 (2006). Zaidel-Bar, R., Itzkovitz, S., Ma'ayan, A., Iyengar, R., Geiger, B. Functional atlas of the integrin adhesome. Nature cell biology. 9, (8), 858-867 (2007).